(1) WHEN TROLLS ATTACK. The London Film and Comic Con told readers how they responded to a trolling attack. Now to an important activity that really did affect us last week and it did catch us out for a few hours until we worked out what was going down. Two days before the most recent big announcement, 15 new accounts were created on our forum and equally, multiple new Facebook members with brand new accounts started following our Facebook page. Then, on the announcement night, the users of these accounts started to aggressively and negatively comment and undermine the guest announcement. This was the ONLY thing they were set up to achieve. This was not noticed by us at first and it took some time to look into these Facebook accounts. As we started to look a little closer, it was clear that we’d attracted a small vocal minority with a real and cynical agenda to purely undermine the guest announcement and belittle any fans or attendees showing any type of excitement. I’ve since learnt this is known as ‘TrollJacking’, where internet trolls post or comment on a piece of content or an announcement to drum up negativity or just to damage the purpose of the thread. What a lovely thing to do. This is something very new to us and it really did catch us out, in fact so much so we left the comments up online – as we believe in freedom of speech and opinion and there’s always the odd bit of negativity with every update or announcement. To all the true fans out there, regardless of whether you are happy about the announcement or not – I am sorry that we did not pick up on it sooner and allowed this minority to cause friction at a time that should have been a time for great excitement and discussion for everyone…. This announcement on Facebook about the appearance of Christopher Eccleston seems to have been the target. (2) CORALINE MEANING. The Guardian interviews Gaiman about the opera based on his book: “Neil Gaiman on Coraline the terrifying opera: ‘Being brave means being scared'”. (3) A NIGHT AT THE OPERA. And The Guardian comments on the performance: “Coraline review – creepy adaptation of Neil Gaiman’s tale will turn kids on to opera”. The Royal Opera have certainly done it proud. The supernatural rubs shoulders with the mundane in Aletta Collins’s production, in which the two worlds are placed back to back as mirror images on a revolving stage. Magic consultants Richard Wiseman and David Britland have been drafted in to provide the special effects, which drew gasps from the audience on occasion on opening night, though Collins also has a knack of suggesting unease by the simplest of means. The scene in which Kitty Whately’s Other Mother produces syringes and surgical needles in an attempt to sew buttons over the eyes of Mary Bevan’s Coraline (“just a little incision under your eyelids”) had me squirming in my seat. Marlee Jane Ward won DUFF (the Down Under Fan Fund) in an unopposed race. She will travel to the US to attend Worldcon 76, to be held in San Jose from August 16-20…. Diana Wynne Jones was prolific and talented, which makes singling out a particular work as a starting point especially problematic. The fact she’s the subject of one of my review projects doesn’t help, as it only expands the number of worthy candidates. Although it is a bit of a cheat, what I would recommend is not a single novel but an omnibus: 2003’s The Dalemark Quartet. It is composed of four early secondary-world fantasy novels that recount the history of troubled Dalemark, from its age of legends to a quasi-medieval period thousands of years later. It must have seemed clear to King that even white people who claim to support equality are unreliable allies — willing to talk the talk and walk a few steps, but only if their own anxieties are put first. Which is why the civil rights movement made what progress it did by effectively shaming white moderates into doing the right thing. This makes me wonder what America is to do in 2018, when our society daily endures a shameless embarrassment of a President, abetted by his shameless party and the shameless media — and when, too often, some white liberals and moderates openly wonder if there’s some way to ease tension between themselves and … fascists. I have no solutions to offer, other than to survive and to try and help as many others survive as possible. It saddens me that we’ve progressed so little in the 50 years since King’s death. I pray it won’t take another 50 years for all of us to know the presence of justice at last. (7) EXPANSE. 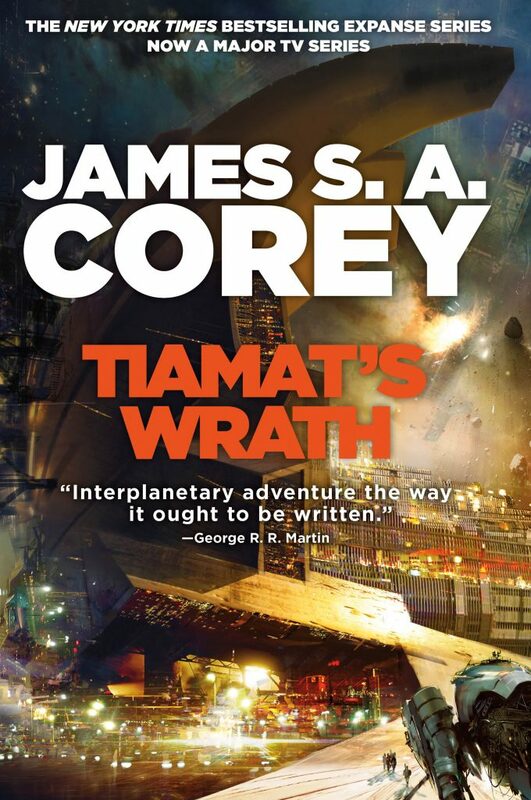 The next Expanse novel will be out in December – Tiamat’s Wrath. (8) THEY’LL BE BACK. The Hollywood Reporter brings word: “‘Riverdale,’ ‘Flash,’ ‘Supernatural’ Among 10 CW Renewals”. The CW, fresh off news that it is expanding to a sixth night of originals for the 2018-19 broadcast season, has renewed nearly its entire lineup. Returning for additional seasons are: Arrow, Black Lightning, Crazy Ex-Girlfriend, Legends of Tomorrow, Dynasty, The Flash, Jane the Virgin, Riverdale, Supergirl and Supernatural. Still to be determined are the fates of midseason fare The 100, iZombie and Life Sentence and fall debut Valor. Official decisions on those four — as well as The CW’s new series orders — will be determined in May. (9) FIGURING IT OUT. NPR’s Glen Weldon finds both style and substance in “‘Legion,’ Season 2: Welcome Back To The Weirdest Corner Of The Marvel Universe”. Legion is the story of David Haller (a perpetually rumpled and vaguely confused Dan Stevens), the world’s most powerful mutant, who’s now free of the evil psychic parasite known only as the Shadow King, who last season assumed the form of his friend Lenny, played by Aubrey Plaza. David’s grown up believing himself to be schizophrenic, but came to realize his true nature when he was taken in by an organization seeking to train him — and to fight the Shadow King, who is in fact an ancient being known as Amahl Farouk (played, this season, by Navid Negahban). Last night’s episode of DC’s Legends of Tomorrow began with a scene captioned ‘OCCIDENTAL COLLEGE–1979,” The camera zooms in on the back of an African-American student’s head. The student, suing an Olympia manual typewriter, dutifully types, “Obama.Political Science 100.” We know that this scence is about Barack Obama when he was a freshman in college. Obama looks out the window and sees a campus in springtime. As the future president is typing, the window is smashed and a giant paw GRABS the president and holds him high in the air! It is Grodd the gorilla, and he’s on a mission. (11) SKYE STOMPERS. Why are the : “Dinosaur tracks on Skye ‘globally important'”? They date to the Middle Jurassic, for which there’s relatively little data. Most of the prints were made by long-necked sauropods – which stood up to 2m (6.5ft) tall – and by theropods, which were the older cousins of Tyrannosaurus Rex. Researchers measured, photographed and analysed about 50 footprints in a tidal area at Brothers’ Point – Rubha nam Brathairean – a headland on Skye’s Trotternish peninsula. The footprints were difficult to study owing to tidal conditions, the impact of weathering and changes to the landscape but the scientists identified two trackways in addition to many isolated footprints. China’s Legal Daily reported the news (and Reuters noted shortly after) following a police press conference; it’s apparently the first cross-border drone-based smuggling case, so likely of considerable interest. Although the methods used by the smugglers aren’t described, a picture emerges from the details. Critically, in addition to the drones themselves, which look like DJI models with dark coverings, police collected some long wires — more than 600 feet long. Send the drone over once with all cable attached. Confederates on the other side attach the cable to a fixed point, say 10 or 15 feet off the ground. Drone flies back unraveling the cable, and lands some distance onto the Hong Kong side. Smugglers attach a package of 10 phones to the cable with a carabiner, and the drone flies straight up. 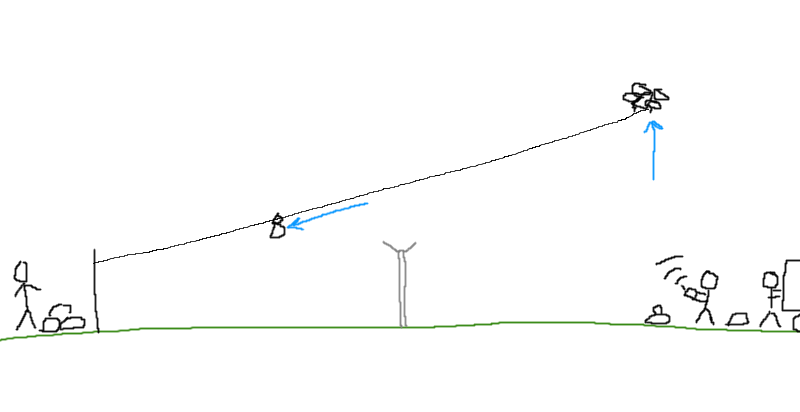 When the cable reaches a certain tension, the package slides down the cable, clearing the fence. The drone descends, and you repeat. (13) READ BUHLERT. Cora Buhlert has some new work available — “A Triple New Release and Some Thoughts on Cozy Space Opera”. I have an announcement of my own to make. And it’s a big announcement, because I have not one but three new In Love and War stories to announce, two short stories and one short novel. (14) BLOOM. The singer of “F*** Me Ray Bradbury” continues her TV career as someone who is late. Rachel Bloom of Crazy Ex-Girlfriend fame will be heading over to another CW show when she guest stars on an upcoming episode of iZombie. Bloom will be portraying a “pretentious theater actor” whose death is investigated by iZombie’s Liv (Rose McIver) and Clive (Malcolm Goodwin), TV Line reported. It’s the middle of August 2019, and you’re in Dublin for Worldcon – a Stranger, if not in a Strange Land, at least in a strange city. A strange city with many secrets, which sometimes only the locals truly know about. You’ve heard all about our native literary giants – George Bernard Shaw, James Joyce, and Flann O’Brien, to name but three – but even they were only human, prey to the wants and needs that mortal flesh is heir to. It’s only natural that you’ll want to know where they would have gone, and where you could go, too. So let me introduce you to one of the hidden architectural gems of my native city: the beautiful public toilets in the National Library of Ireland….